This guide starts at the car park. Along the driveway can be seen some track let into the surface of the path. This is a siding that enables visiting locomotives to be downloaded from the car park. It is connected to the mainline via a temporary sliding piece of track. 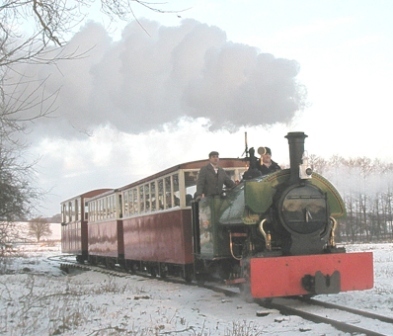 Tickets may be purchased from the Booking Office, which is based on the designs of Colonel Stephens on the Rye and Camber Tramway. The Booking Office also doubles as a shop, with a full range of gifts and books, etc. From under the canopy the platform of Amerton Station may be reached. The platform forms part of a passing loop where the locomotive can transfer from one end of the train to the other. Behind the platform shelter may be found the museum (the former platform shelter from Stowe-by-Chartley Station), the Locomotive Shed, and the Yard. Access to the shed is limited, but there may be time for a member of the train crew to give a guided tour of the other locomotives and items under restoration there. One job of the guard is to check tickets and to attach the safety chains, before signalling “Right Away” to the driver. 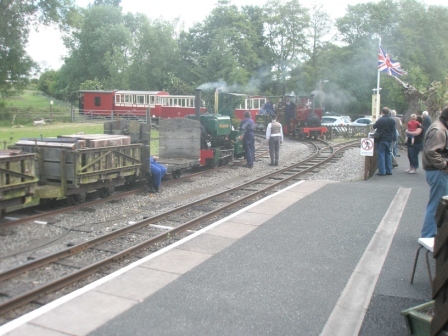 On the assumption that the journey is clockwise round the circuit, the ex-LNWR Ground Frame that controls this part of the railway is passed at the end of the platform, and then the Yard may be seen on the left. This gives access to the locomotive shed, carriage shed, inspection pit, new workshop and sidings via a head-shunt that runs alongside the mainline at this point. Various items of equipment may usually be seen, including locomotives, wagons, rail or sleepers, and perhaps a JCB backhoe and dumptruck. The line then straightens out and climbs at 1 in 100, passing two farm crossings and the footpath before continuing past the oak trees and onto a tight left-hand bend where the grade increases to 1 in 75. 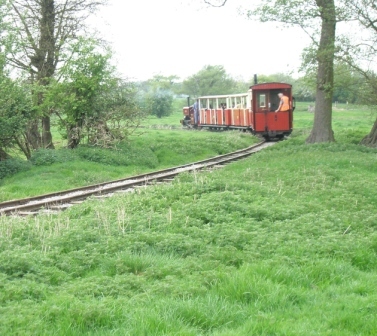 Immediately after this there is a gentle right-hand curve passing the third crossing and reaching the summit of the line. From here the line falls slightly before passing the site of the temporary top terminus of Phase 1, which was the limit of the line from 1992 to 1999. The former top terminus has been converted into wagon storage and is now known as Stump Siding. Continuing, the line takes up its position hugging the fence line and drops gently on a right-hand curve before straightening, and then crossing a culvert alongside a small area of wetland. The line then climbs steeply through a set of reverse curves, and enters the left-hand road of the Chartley Road Loop. This was the limit of the Phase 2 line, and trains turned round here from 1999 to 2001. 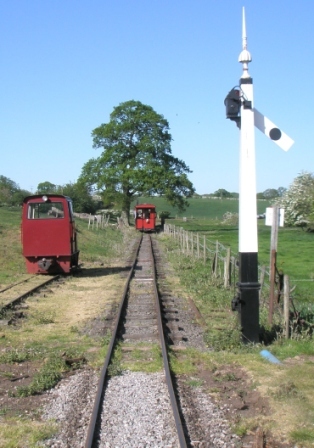 It is now Chartley Road Station, with a passing loop used during token working. It is also used as the location of Santa’s Grotto during the weekends of December. At the end of the passing loop the line follows the right bank of the Amerton Brook for a long straight. Then the line curves right, passing an occupation crossing and footpath alongside the wetland, before emerging from the trees and taking a sharp left-hand bend to cross the Amerton Brook by Bridge No. 2, substantially built in steel. Continuing along the left bank of the brook, another farm crossing is passed before the line climbs up in the next field and then drops steeply at 1 in 35 on another tight bend to cross the brook for the second time by Bridge No. 1 (identical in construction to Bridge No. 2). 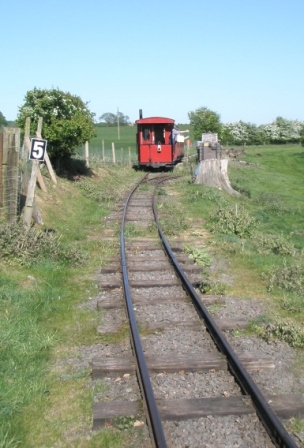 The circuit is completed by the line entering Amerton Station near the Booking Office. 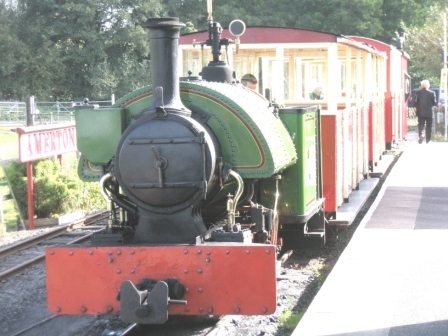 The circular route of the line enables travel in either direction, with token control if two or more locomotives are in steam, and demonstration goods trains have been run at the same time as passenger trains on Gala Weekends.